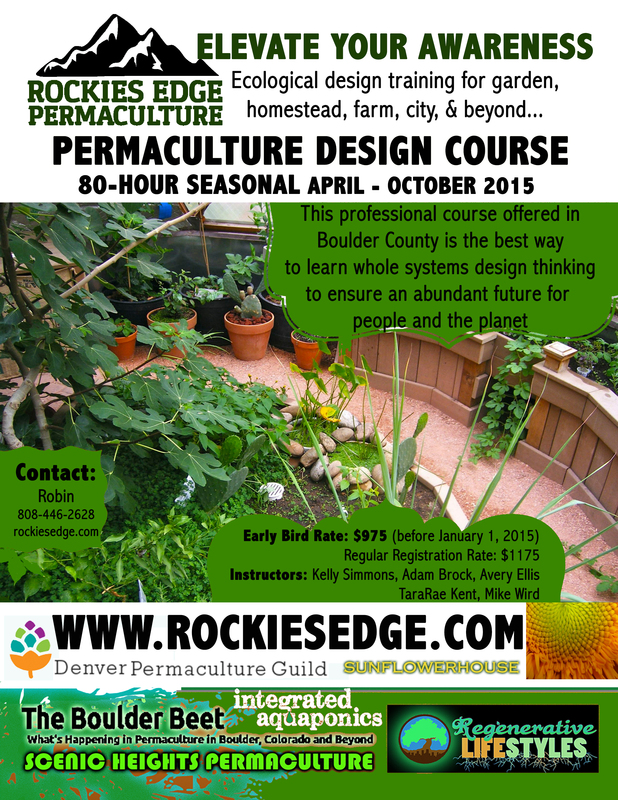 We are excited to announce that the Rockies Edge Permaculture Design Course is here to elevate your awareness in 2015! A passionate group of teachers have come together to offer this comprehensive Permaculture Design Course in beautiful Boulder Colorado. The 80-hour course explores innovative concepts and will focus on creating a community of abundance, while teaching whole system design for garden, homestead, farm, city, and beyond. Check out our top notch Instructors, each of them bringing unique skill sets and teaching styles to the course. It is important for us to include everyone as diversity creates the circumstances for growth! We welcome students, parents, designers, builders, educators, government officials, elders and beyond. We will be offering fun and engaging children’s permaculture workshops alongside our course, where the youngsters can learn about similar topics, and make their own designs for a bright future. Please share this course offering with everyone you know, as the future depends on great people coming together to design for resilience! At the Rockies Edge, we are learning from the past and training for the future. We look forward to designing and growing with you! i understand that the instructors teaching the class are brand new and are being advised only by the two seasoned instructors,Adam and Kelly. This slightly misstates the class instructors apparent billing as kelly and Adam are on top and are only advisors to the other instructors. Hi David – Thanks for asking. You are correct that this course is being taught by seasoned lead instructors, Adam and Kelly, working with a guild of apprentice instructors, Tara, Avery and Mike. Your assumption about misstatements and “only advising”, however, is incorrect. Adam and Kelly are the lead instructors who are teaching this course along with a guild of apprentice, developing permaculture instructors. These talented, knowledgeable apprentice instructors are experienced in many aspects of teaching permaculture design, they all have a permaculture teaching certificate and are not new to teaching. Apprenticing in a course (or several) is the next required step in their development as excellent permaculture design teachers. They will be teaching parts of the course under the mentorship of Adam and Kelly. Either Adam or Kelly, or both, will be present for the entire course and personally teaching many parts of the course. As mentors, we do advise our apprentice instructors, but that is not all we do. We also review their lesson plans and provide instruction. We also teach many parts as our apprentice instructors watch and learn. This is the role of lead teachers working with apprentice instructors. 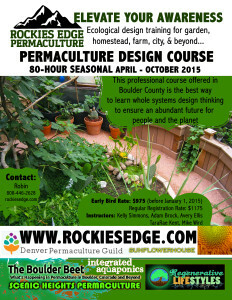 It’s how we develop excellent instructors in permaculture design and deserves your support. How do I apply for the scholarship?! I would love to sign up for this course! !